I have a serious fascination with YA & Teen lit right now. Partly because I feel that these authors write with more purpose, as their audience is tough, and partly because I have three kids who are racing towards teenage years. I hope that my kids will be readers when they are teens, but just in case I'm getting prepared with great options. And when I saw a chance to read Susan's new book, I was in! I mean a teen book series, that wants teen boys to read it, of course I'm in. 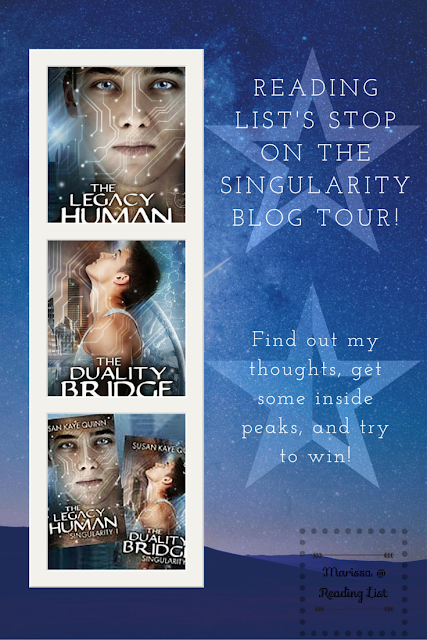 Seventeen-year-old Elijah Brighton wants to become an ascender—a post-Singularity human/machine hybrid—after all, they’re smarter, more enlightened, more compassionate, and above all, achingly beautiful. But Eli is a legacy human, preserved and cherished for his unaltered genetic code, just like the rainforest he paints. When a fugue state possesses him and creates great art, Eli miraculously lands a sponsor for the creative Olympics. If he could just master the fugue, he could take the gold and win the right to ascend, bringing everything he’s yearned for within reach… including his beautiful ascender patron. But once Eli arrives at the Games, he finds the ascenders are playing games of their own. Everything he knows about the ascenders and the legacies they keep starts to unravel… until he’s running for his life and wondering who he truly is. 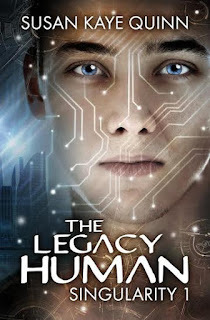 The Legacy Human is the first in Susan Kaye Quinn’s new young adult science fiction series that explores the intersection of mind, body, and soul in a post-Singularity world… and how technology will challenge us to remember what it means to be human. Since I read both books, there was a lot to like. I wish I could tell you everything, but that would take too long.... Elijah is the kind of kid most parents hope their kids become as they start to venture outside of mommy's protective bubble. While Elijah is facing some seriously hard morality issues, he still strives to be polite and a gentleman, even though he often messes up. There is a ton of action in these books. It's hard to stay bored! The first book, The Legacy Human, had more of the mind/intellectual action, while The Duality Bridge certainly added some actual heart racing action. I'm pretty sure many teenagers would get into it. My biggest issue lied in the first book mostly, as the introduction lasted for most of the book. I realize that there was a lot of set up that needed to happen, but the olympics seemed to drag on in preparations. I fear that if I was often bored, and kept putting the book down because of that, teens certainly would. And if you don't get through that intro, well you miss the real action. I'm also not a huge fan of robot science fiction, and this series is all about AI. While cool and interesting, I just couldn't get into some parts of it because of all the robots wandering the scenes. 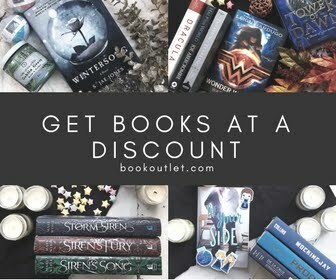 These books are detailed; the reader will find himself in a whole new world. As a series there is plenty of space for the why to developed as well as the how. If you are interested in AI, science fiction, and the questions of how soon science can help people live forever, this is a must read! I'm going to have to give the whole series a three heart rating. It wasn't really my style, too much AI, and the second book especially suffered some serious grammatical & editing issues (rushing to meet details I'm sure). There is also a lot of Religion discussions, Christianity, Buddhism, and others, which some audiences might not appreciate. However, I'm sure for the right audience this series would rank higher. I would recommend this book to any one who loves AI stories and the idea of science advancing enough to keep people alive forever. Any teen really could read this book, it's very clean. 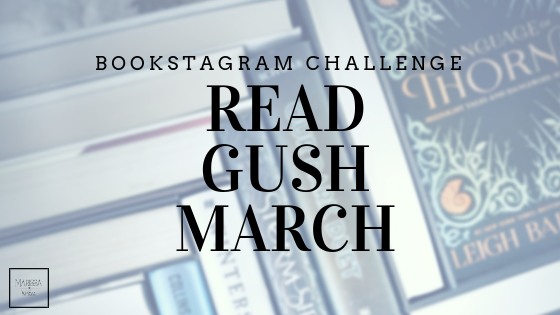 Yes there are some romance scenes and discussion of finding love, as well as some violence, I think it's all in the wheelhouse for teen readers. While I mentioned this is a great series for teen boys, there is no real reason why girls wouldn't be into the story if they are into science fiction. With the rise of the strong female heroine, do you feel that the lead male character is no where to be found? Share some recent, and not so recent, books where the male lead is a great role model for teen boys. Thanks!